Liberty’s Mitchell Okuley (24) leads his teammates toward Brennan Rowe, who was waiting in the middle infield after singling him home for the game-winning run in Thursday’s 5-4 Division I district championship win over Marysville. It’s not often that a baserunner goes first to third on a sacrifice bunt. 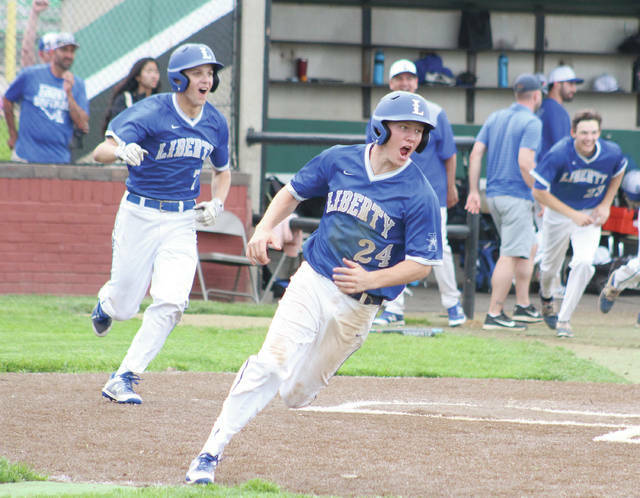 But, that’s exactly what Mitchell Okuley did to set up Brennan Rowe’s walk-off single to give the Olentangy Liberty baseball team its fourth district title and first since 2015 with a 5-4 win over Marysville Thursday at Dublin Coffman High School. Okuley, who had two hits and two walks in four plate appearances in the game, led off the seventh with a walk. Marysville decided to change pitchers, bringing in Garrett North from third base as the reliever. The top-seeded Patriots decided to take advantage of a new third baseman when Carson Comer, who had sacrificed twice in three previous plate appearances, bunted down the third base line. Okuley went right through second on the throw to first and beat everybody to the bag at third. “Ok’s an elite athlete,” Liberty coach Ty Brenning said. “Ok’s a three-sport guy. You talk about playing the game the right way, playing the game fast and having great instincts and awareness … that’s all Mitchell Okuley. Rowe followed with a groundball base hit through the left side of a drawn in infield for the game-winner. Brenning has a lot of trust in Rowe, a sophomore. He bats third in the lineup and rewarded the coach with two hits and a pair of RBI, including a single in the first inning to give the Patriots (26-4) an early 1-0 lead. Brenning had to use two of his top pitchers in Jack Metzger and Mitch Milheim in the district semifinal win over rival Orange – a game that took two days to play. So, he turned to Rowe for the district final. And Rowe rewarded that choice with a complete-game victory. He allowed four runs (two earned) on four hits, a walk and a hit-batter and struck out three. Rowe’s turning point this season was an April 21 start against Cleveland St. Ignatius. He allowed one unearned run in a complete-game win. “Brennan had a great experience … and it really prepped him for this moment,” Brenning said. Rowe set down the first six batters he faced against Marysville, striking out three along the way. He got into trouble in the third when he hit Kaleb Shultz to lead off the inning. Michael Bonczak followed with an infield single. Blake Storr drove in Shultz on a groundout to tie it 1-1 after Tyler Drope moved the runners over with a sac bunt. Gavin Sharp gave the 16th-seeded Monarchs the lead with a single to left to score Bonczak. Liberty came right back in the bottom half. Corbin Parrish hit a RBI single to tie it and Corey Mayer drove in Parrish with a double to give Liberty a 3-2 lead. Sharpe, who led the Monarchs (17-10) with a pair of hits and 3 RBI, hit a two-run double in the fifth to put Marysville back on top 4-3. Connor Osmond worked a two-out walk in the sixth and scored all the way from first on Justin Nelson’s double down the left field line to tie it 4-4. Tate Virts allowed five runs (three earned) on seven hits and four walks and took the loss for the Monarchs. Liberty moves on to the regional semifinal round where it’ll face Lancaster Thursday at 2 p.m. at Dublin Coffman High School.